The Opposition Leader said the budget will not bring any concessions to the people and they will soon begin to feel its effects. It was regrettable that a group of parliamentarians from Sri Lanka Freedom Party leaving the Chamber without voting on the budget yesterday. 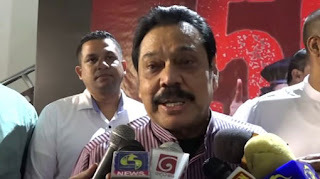 When queried on Sri Lanka co-sponsoring the resolution the resolution that will be brought forth by the United Kingdom, the Opposition Leader said that it will have severe effects on the country.